This is a notice of our privacy practices here at Kidmunicate. This notice describes how personal information about your child may be used and disclosed and how you can get access to this information. Please review it carefully. You can ask to see or get an electronic or paper copy of your child’s medical record and other health information we have about your child. Ask us how to do this. We will provide a summary of all of your child’s health information, usually within 30 days of your request. We may charge a reasonable, cost-based fee. You can ask us to correct health information about your child if you think it is incorrect or incomplete. Ask us how to do this. We are not required to agree to your request, and we may say “no” if it would affect your child’s care. We will say “yes” unless a law requires us to share that information.Ask us to limit what we use or share. We are not required to agree to your request and we may say “no” if it would affect your care. You can ask for a list (accounting) of the times we’ve shared your child’s health information for six years prior to the date you ask, who we shared it with, and why. We will include all the disclosures except for those about payment, health care operations and certain other disclosures (such as any you asked us to make). You can ask for an additional paper copy of this notice at any time, even if you have agreed to receive the notice electronically. We will provide you with a paper copy promptly. Choose someone to act for your child besides you. If you have given someone medical power of attorney or if someone is else is the legal guardian, that person can exercise your rights and make choices about your child’s health information. You can file a complaint, if you feel we have violated your child’s rights or yours. You can complain if you feel we have violated your rights by contacting us using the contact information below. We will not retaliate against you for filing a complaint.File a complaint if you feel your rights are violated. In the following cases, we may ask for permission to share your information. If so, we would ask for written permission and you always have the right to say no. Marketing purposes: We do like to share success stories. You can also say that we can share the story anonymously. Cause related fundraising: It’s highly unlikely, but we may contact you for fundraising efforts, but you can tell us not to contact you again. We typically use or share your child’s health information in the following ways. We can use your health information and share it with other professionals who are treating your child. Example: An SLP treating your child for Childhood Apraxia of Speech may want to talk to the OT about fine motor skills. We can use and share your child’s health information to run our practice, improve your child’s care, and contact you when necessary. Example: We use health information about your child to manage his/her treatment and to assign therapists. We can use and share your child’s health information to bill and get payment from health plans or other entities. Example: We give information about your child to your health insurance plan so it will pay for services. We have to meet many conditions in the law before we can share your information for these purposes. For more information see www.hhs.gov/ocr/privacy/hipaa/understanding/consumers/index.html. We will share information about your child if the state or federal laws require it, including with the Department of Health and Human Services if it wants to see that we’re complying with federal privacy law. We can share health information about your child in response to a court or administrative order or in response to a subpoena. We are required by law to maintain the privacy and security of your child’s protected health information. We will let you know promptly if a breach occurs that may have compromised the privacy or security of your child’s protected healthcare information. If you tell us we can share information, you may change your mind at any time. Let us know in writing if you change your mind. If you have any question on comments feel free to contact one of our privacy officials listed below or any member of our staff including the Director of Clinical Services. Deb Sampson, VP Managing Director. 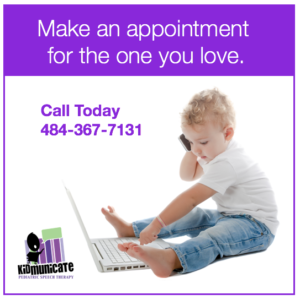 She can be reach at dsampson@kidmunciate.com and/or 484-367-7131. He can be reach at fdicari@kidmunciate.com and/or 484-367-7131. Get a form our office. The form is in our HIPAA Manual. This notice was originally published on October 28, 2014. The latest revision was December 28, 2018.